Demolition machines - Kobelco Construction Machinery Europe B.V. 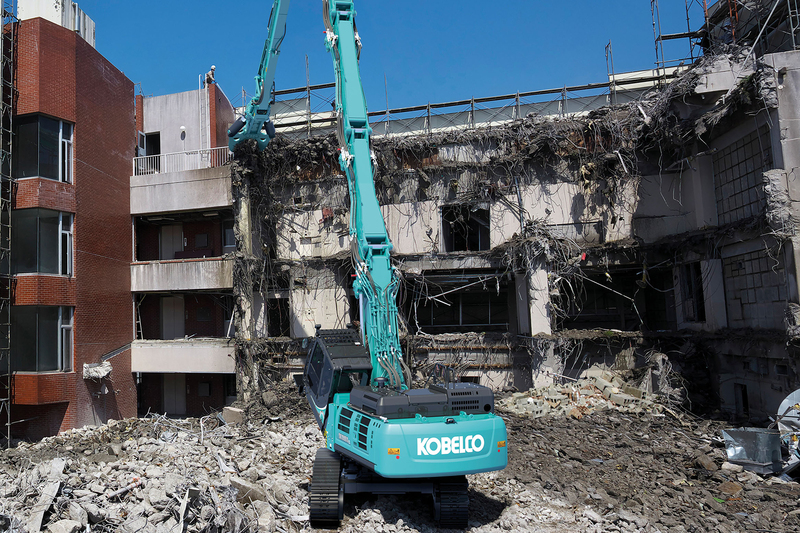 Following several years of research and development, including valuable feedback from the European market, Kobelco introduced three machines to European demolition market. All models feature Kobelco’s proven NEXT system for both high elevation and foundation demolition work, provide a safe and quick solution for the assembly/disassembly of attachments and maintenance and enable easy transportation between projects, for significant cost savings. The new-generation NEXT demolition attachment for the demolition machine with common use type base boom was designed by Kobelco without being limited by existing concepts. Each boom attachment has a block structure that simplifies assembly and transport, and the attachments employ our original NEXT joint system. The piping can be connected at ground level, and the steps for attachment assembly/disassembly from pressure release to pin fixing can be completed safely in a short time. Kobelco helps provide the owner reduced operational costs, less downtime and greater return on investment. Kobelco demolition machines are the next generation of high performance and cutting-edge technology. Like Kobelco’s other heavy excavators for Europe, the Kobelco SK350DLC-10, SK400DLC-10 and larger capacity SK550DLC-10 are hand-built in Japan and feature a host of Kobelco-developed demolition-specific technologies too.